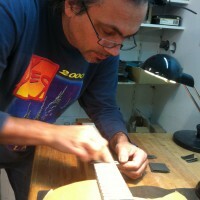 Since 2005 Andreas Thiemann has worked as an electric guitar manufacturer, first in Cologne, then in Bonn. His instruments are designed according to the wishes of his customers and his own ideas. He manufactures guitars not only to meet the challenges of professional players, but also for all who cherish the pleasure of an individual guitar. Right now he has a project line under development that will present a “Mother and Child” guitar set. It consists of a full size guitar and a 7/8 size model. His instruments always strive for visual and acoustical harmony. Their sound is modelled after vintage guitars, while their appearance embodies a variety of modern shapes.